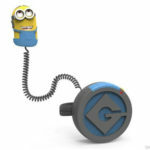 Your child will love making wacky sounds with the Minions Movie Voice Change Communicator, which lets your little one change the sound of his or her voice. The fun design is great for little fans of the Minions movie. Batteries not included (4x AA).